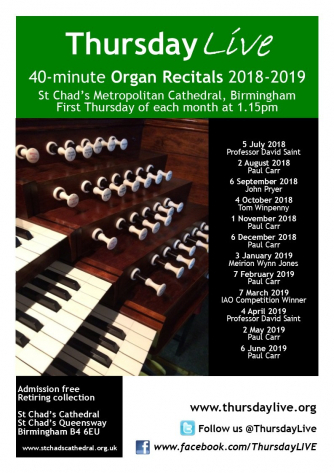 40-minute Organ Recitals at St Chad’s Metropolitan Cathedral, Birmingham on the first Thursday of each month: 1.15pm – 1.55pm. The organ of St Chad’s Cathedral dates from 1993 and was built by J. W. Walker & Sons as part of the Cathedral’s 150th anniversary restoration. There are 40 speaking stops and it is considered one of the finest organs in the Midlands. Thursday Live was established in 2008 by Paul Carr at St Paul’s Birmingham. The series transferred to St Chad’s Cathedral in June 2016.